So many people have asked me how I got into home exchanging that the topic deserves a blog entry all on its own. Home exchanging is exactly what it sounds like: you exchange homes with another person who lives in a different city or country from your own. Now, if you’re the type of person who gets uncomfortable (Baby Bear–style) at the thought of someone sleeping in your bed or eating from your porridge bowl, then home exchanging is probably not for you. If not, then read on. I started home exchanging the year I wanted to meet up with family members in Amsterdam in August, and then join some friends for a long-planned trip to Italy in October. I couldn’t afford to fly back and forth. Since I can work anywhere I have an Internet connection, I looked into renting an apartment for the month of September. That, too, was a bit beyond my budget, so I signed up with a home exchange site. These sites typically charge you a fee for posting your profile, but everything about the exchange is arranged privately between you and your swap partner. I posted my photos, wrote up a description of my home and a few details about my neighbourhood, and then … I waited. I was shocked and pleasantly surprised to receive my first home exchange offer within days. After some back and forth negotiations and a phone call, my partner and I agreed to exchange for a month. Both of us were “home exchange virgins,” but speaking with him on the phone helped alleviate any concerns I had. The key to home exchanging is to be flexible. I had dreams of spending a month in a Parisian garret, but “settled” for my first offer ― a house in Zaandam, only a twelve-minute train ride from Amsterdam. I say “settled,” but it wasn’t, really. It was a great offer. I spent four weeks in that house, and then went on to London where I’d arranged a swap with a couple who had a family wedding in Vancouver. Since then, I’ve done four more exchanges. Not all of them were long term or overseas ― a friend and I once spent a weekend in Portland, Oregon, and my closest exchange was in Victoria, BC. Home exchanging is perfect if you’re interested in experiencing a foreign city “as the locals do.” I loved shopping in the supermarkets of London’s East End and in northeast Paris ― far from the tourist zones ― and commuting home at the end of a day of sightseeing along with the Londoners and Parisians heading home from their offices. That’s not to say all home exchanges are out in the suburbs ― far from it. One of my exchange homes in Paris was only a ten-minute walk from Notre Dame. Obviously, the other benefit of home exchanging is having free accommodation. That’s not to say you don’t have to do a bit of work. I use each home exchange as an opportunity to do a massive spring cleaning and to make sure everything in my home is in good repair. On the other end of the exchange, you have to clean your partner’s home before you vacate it. The deal is you each leave the other home exactly as you found it. Keys are exchanged in person, sent through the mail, or left with a neighbour. I prefer to meet my fellow exchangers in person, simply because they are all such interesting people, but when circumstances don’t allow it, I can’t say not meeting my exchanger detracts from the experience. 1. There are dozens of home exchange sites out there; choose one that suits your interests and needs. Some, for example, cater to particular types of travellers, such as teachers and academics who have similar holiday schedules. Be sure to do some sample searches to make sure the site you sign up with has enough listings in the areas you’re interested in travelling to. I thought it would be easier to find a long-term exchange with another single person, so I signed up with a site that caters to singles. However, the site had so few listings that I received only one offer through it, whereas I’ve had dozens of offers through a second site I signed on with. Guess which one I’m still with? 2. Read each profile carefully before sending an exchange offer. I was surprised to get an offer from a family who wanted a house with a pool ― clearly they hadn’t read my profile! I myself have learned not to contact people with school-aged children because my preferred travel time is in the fall, when kids are in school. 3. Think of ways to make your offer sound more attractive. If you have a young child, advertise your home as baby-friendly to make it more appealing to other young families. Like animals? Offer to cat- or dog-sit if your potential swappers have a pet. 4. Be flexible and plan ahead. I can’t emphasize this enough. Arranging a home exchange is not like booking a hotel. If the location is important to you, offer a lot of flexibility in timing. If getting an exchange for a particular date is critical, be open to locations that might not be on the top of your list. When I was searching for an exchange in Portland, I had specific dates in mind. To sweeten the deal, I offered my potential swappers the choice of staying in my home during the weekend I wanted to stay in their house, or for an entire week in the summer when I was going to be away visiting family. They took the week and arranged to visit a daughter who lived out-of-state the weekend I and my friend stayed in their home. They thought they got the better end of the deal, but I was happy because I got my swap on the exact weekend I wanted. 5. Be clear about all expectations. Are long-haul flights involved? Confirm your dates before booking flights and, after booking, confirm your flight dates and times with your swap partner. Want to have friends or family members visit you at your swap home? Ask for permission before you invite guests to stay for a weekend or longer. Under what circumstances would either of you back out of the exchange? Make sure you have similar expectations about what you would do and what you would offer in compensation. After four successful, problem-free exchanges, I was shocked when a home exchanger told me I’d have to vacate her Parisian flat only days after my arrival. We had agreed to a three-month exchange, but hadn’t discussed any what-if scenarios. When personal circumstances required her immediate return to Paris, I had to find a new place to live ― or return home. Fortunately, I found another suitable home exchange within a week, but that was a close call on my part. In future, I will be much more careful about discussing all aspects of the exchange with my swap partner. 6. Once you agree to a swap, prepare your home. Put away any belongings you don’t want your swappers to use. Make sure everything is in working order. Leave written instructions for how to access the Internet, and how to use the TV, stereo, and appliances. Leave an emergency contact number. Make some room in your closets and clear out a dresser drawer or two, especially if it’s a long-term swap. 7. Be a good host. Leave plenty of brochures and perhaps a guide book of what to see and do in your home town. I also provide transit schedules and take-out menus. 8. When you arrive at your home exchange, expect to be a little self-reliant. There’s no concierge to call when you can’t figure out how to turn on the stove or if the hot water goes off. Also, after swapping with bachelors (twice), I’ve lowered my expectations about what a well-stocked kitchen contains. Now, if you’ll excuse me, I have to reply to my latest exchange offer: a beach house in southern California for eight weeks next summer. Many summers ago, I spent four weeks in Prague. Some years later, I came across a photo of the Charles Bridge and the Castle covered with a fresh blanket of snow. I don’t know if it’s because I’m Canadian, but I immediately said to myself, “Someday, I’m going back to Prague and I’m going in the wintertime. I want to see it with snow.” I finally got my chance last winter. I took this photo on my first morning. It was snowing lightly. I felt like I had walked into a fairy tale. Vancouver received a blanket of snow this week. It doesn’t happen often and it never lasts long, but when it does, it’s awfully photogenic. As is my custom, I indulged in a DVD marathon over the holidays. This year it was Julia Child’s “The Way to Cook.” I don’t know about you, but six hours of watching Julia create magic in her kitchen makes me want to attempt some magic in my own kitchen (albeit much more clumsily). Which leads me to Julia’s coq au vin. I was first introduced to this king of stews by a friend of mine, who spent her two-week Christmas break with me last year in Paris. Since I had a (more or less) fully-equipped kitchen at my disposal, she got right into shopping at the French supermarkets and cooking up culinary masterpieces for me every night. For the coq au vin, my friend wanted to use an entire chicken. I assured her the largest bird that would fit in my one, very small sauce pan was a coquelet ― a cockerel ― which are as common in French supermarkets as Cornish game hens are over here. I showed my friend how to cut up the coquelet, then left her to it. Scarcely an hour later, I was in heaven. For what is essentially chicken stew, coq au vin has amazing flavour. 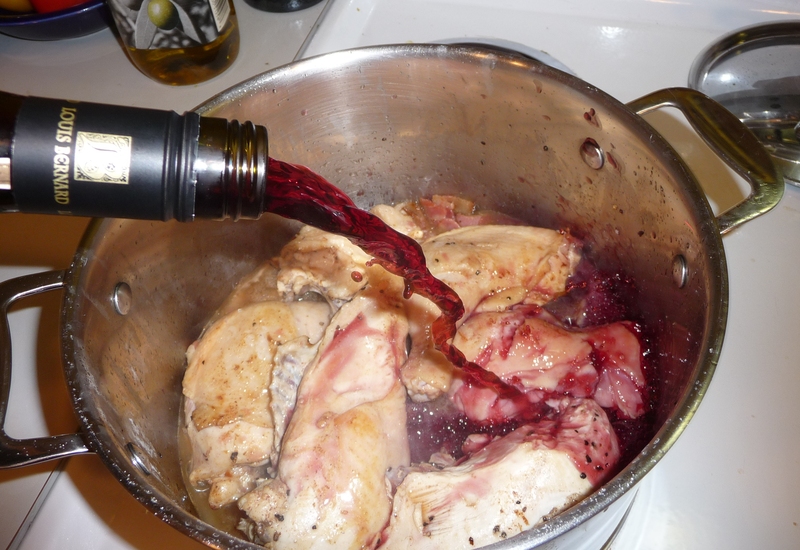 Since returning to Canada, I’ve made coq au vin several times myself. My friend used carrots in her version, but I don’t care for them and, after reading in my copy of Mastering the Art of French Cooking that Julia didn’t use them either, I dropped them. I also have come to love the braised onions Julia recommends serving with the stew. The flaming-cognac stage though ― that I dared not try. To be honest, setting a pan of chicken ablaze in my condo-sized kitchen intimidated me. However, getting back to my DVD marathon, when I watched Julia flame her chicken, I thought, “I can do that!” And so, I did. Truth is, it wasn’t as scary as I imagined. If you happen to have a bottle of cognac in your liquor cabinet, don’t skip this step. It will make you feel very French. 2. In a large sauce pan, Dutch oven, or cocotte, brown the lardons in butter. Remove from pan. 3. Dry the chicken thoroughly, then brown all sides in the hot fat. 4. Season the chicken with salt and pepper. Return the bacon to the pan. Cover and cook slowly for 10 minutes, turning the chicken once. 5. Pour in the cognac and light. Wait for the flames to subside, shaking the pan back and forth a few times. 7. Add the tomato paste, garlic, herbs, and enough stock to cover the chicken. Bring to a simmer, then cover and continue simmering for 25 to 30 minutes until the chicken is tender. Remove the chicken from the pan. 8. Skim any fat from the liquid remaining in the pan, and simmer for a minute or two. Bring to a boil and reduce to 2 1/4 cups. Remove from heat and check seasoning. 9. Mix the butter and flour into a paste. (This is called beurre manié.) Use a whisk to mix the beurre manié into the liquid. Return to heat and simmer for a few minutes until sauce has thickened. 10. Return the chicken to the sauce to reheat. The onions and mushrooms can be added to the sauce or served on the side. I prefer to serve coq au vin over a pasta such as tagliatelle, but it would probably also go very well with mashed potatoes. The small onions are a bit finicky to peel, but worth the effort because they are oh so good. Do not skip. In France, Epiphany brings out the galettes des Rois, or king cakes. Every pâtisserie sells these. They are made of flaky layers of puff pastry. The centre is filled with a sweet almond paste. Hidden inside the galette is la fêve. Originally these were beans (fêve = broad bean), but nowadays, they consist of porcelain figurines. Whoever finds the fêve in their piece of galette gets to be “king” or “queen” for the day. We don’t often get frost in Vancouver, but on those rare mornings when the mercury does dip below 0°Celsius, it’s a great excuse to get out the camera and go for a walk.